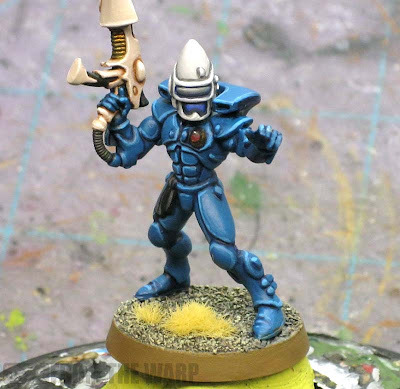 From the Warp: Only painting what you can see on the model? Only painting what you can see on the model? Or maybe a better headline might be how comics imitate real life when it comes to the hobby. That's why they can be so funny sometimes and hit a little close to home. When Ninjabread posted this particular comic the other week, it made me laugh to no end. Partly because it hit so close to home for me. Whether or not it's true, I don't know. I've never been to Warhammer World to see the model in question for myself. But it still made me laugh. So what's my Eldar model have to do with any of this? If you check out the picture below, you can see that only the front has been painted. Since I was using it as an example for a specific tutorial and would only be photographing the front of the model, I saw no need to paint the back of it. You can see the back of his helmet is not finished and his gun has even less done to it. I really did paint just what could be seen in the picture. I hope I didn't just crush anyone by showing them this little "behind the scenes" look at what I do on occasion. Most of the time I paint the whole model, honest. It's just the underside of them I almost never paint. Haha, this post gave me a good laugh. Thanks. Challenge for your next game: paint only one side of all vehicles and maneuver them so only the painted side is ever visible to your opponent. I was half-tempted as a joke to do similar to an army and then sell them on ebay... But would never do that as it'd be cruel! Mwah-ha-haaaa! I have been to WHW by the way, and can confirm that not only are the front and back of the miniatures painted impeccably, but also the underneath as well - I believe their cabinets have mirrored bottoms. There's nowhere to hide bad painting! Paul D. That might be tough, I'd only be able to use certain weapons on the vehicle. Darren: There you go... from someone who has seen the models in real life. I'm still not painting the underside though. Hee hee. Thanks for the shout out Ron. It's more noticable on the Lizardmen diorama where unpainted angles make it into the White Dwarf photos. I think everyone does this to a certain degree, wasnt it the whole "if you cant reach it with a brush, you cant see it normally anyway?" Lot's of people go by the 12 inch rule, if it looks good from a foot away it's done. I also know a lot of people who make sure every single model is immaculate in its paint job. It just depends on the player I guess. I like mine to look thoroughly complete even on close inspection, but of course never paint the undersides, or areas that will be wreathed in shadow from any angle. 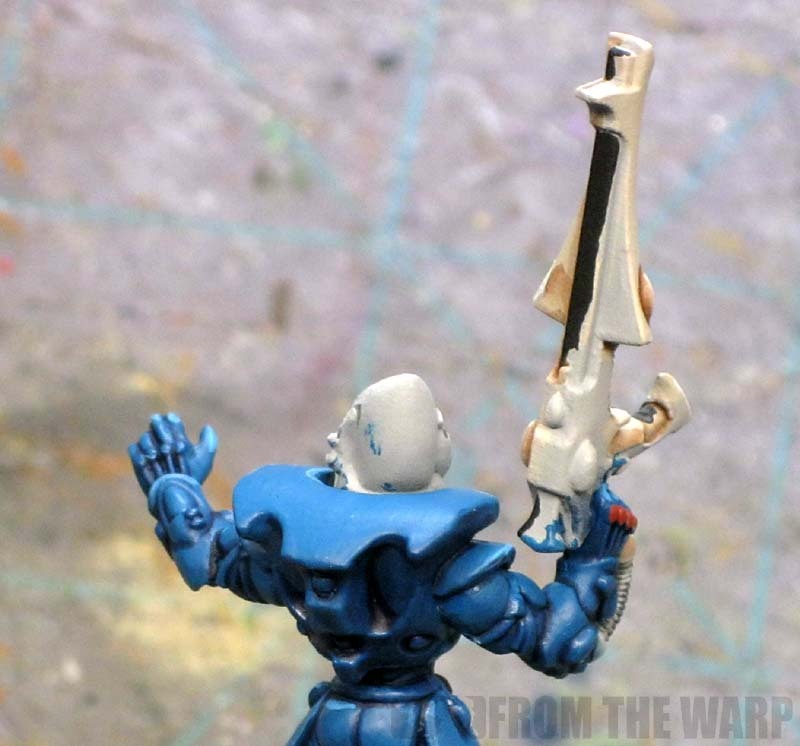 Well, I paint on models that are fully assembled, and there are areas on model that are hidden behind the model's own arm, weapons and stuff...I tend to leave them unpainted. See, I knew there were other people who did this too. Maybe not to this extreme, but I knew there were others that didn't paint the whole model or simply skipped on the areas they couldn't get the brush in to. You definitely are not alone in this. Man, I feel cheated. Like when I learned Santa Claus wasn't real. :( Lol. Seriously though, that's pretty cool. Never thought of doing that for the blog since everything I do is intended for the tabletop. Kudos for keeping everyone fooled for so long. Kevin: Who doesn't build them completely before painting? There's another way to paint them? I paint my model in components and then decide what kind of pose he'll have. It has the benefit of meaning that I can't play with a model until its painted and the other benefit of allowing me to see what the 'pose' will look like painted. As a result, it doesn't pay for me to cut corners - or in this case, cut sides. Painting the new Doomwheel kit largely broke me of this habit and I'm glad of it. I certainly can't imagine trying to paint that kit after it would have been assembled. Diaord: I never thought of doing that. I always have my pose figured out before I start painting. pdelair: I can see that. some bigger models need to be done in parts... it just makes it easy.